Cheltenham Art Gallery & Museum has re-emerged from over two years of building works as The Wilson, a reference to local hero Edward Wilson, physician, natural historian and artist, who died with Captain Scott in Antarctica. But for many people the real joy of a visit to this outstanding institution is the opportunity to see the nationally important Arts and Crafts Movement collection. The collection includes work by almost all the main practitioners such as C R Ashbee, William De Morgan, May Morris, Ambrose Heal, and M H Baillie Scott. It includes furniture, metalwork, embroidery, ceramics as well as some of the more unusual crafts, such as plasterwork and puppet-making, adopted by the hands-on practitioners who followed in the footsteps of William Morris. It is a living collection because the Arts and Crafts Movement was not really a style but an ideology and a way of life that is still relevant today. It is all about the life-enhancing qualities of creativity and making things and the importance of well-made and functional design. The collection at Cheltenham began in the 1920s focussing on the Cotswolds. It was the brainchild of the enthusiastic and passionate Daniel Herdman, the librarian curator who moved to Cheltenham from the north-east in 1921. Like many of the leading figures of the Arts and Crafts Movement he saw the crafts as a means of reviving rural life. He built up strong relationships with local designer-makers, visiting May Morris for tea at Kelmscott Manor, buying beautifully made and functional pieces by local blacksmith Alfred Bucknell and Michael Cardew at Winchcombe Pottery to be sent out to inspire schoolchildren, and providing the young Gordon Russell with his first public exhibition. In response to the growing international interest in William Morris and the Arts and Crafts Movement in the 1970s, the Cheltenham collection was expanded. Important pieces such as a table designed by William Morris in the 1850s and a collection of furniture by the architect designer C F A Voysey were acquired. And when the first extension to the Art Gallery & Museum was opened in 1989 craft commissions were chosen to enhance the new galleries. Glass artist Chinks Grylls designed and made a window for the Arts and Crafts Movement gallery, artist blacksmith Alan Evans designed and made a metal grille for the exterior, and letter cutter Bryant Fedden cut the dedication panel. The practise of keeping the collection fresh and vibrant has continued so that in 2009 ceramicist Edmund de Waal created an installation ‘Very Moveable Things’ for the Arts and Crafts Movement gallery. As part of his support for local craftspeople the curator Daniel Herdman was also involved in setting up the Gloucestershire Guild of Craftsmen in 1933. Work by many of the founder members, including Michael Cardew, hand-block printer Phyllis Barron, and silversmith George Hart, is now represented in Cheltenham’s collection. So, eighty years on, it is fitting that the Gloucestershire Guild is now moving its permanent base to the extended Art Gallery & Museum site. The new shop and gallery The Guild at 51 opens on 5 October, providing visitors with the opportunity to see, buy, and commission work by nearly seventy professional designer-makers. There will also be a series of special events showcasing the work of invited makers, starting with the ceramicist Joseph Hartley from Manchester, winner of the 2012 Young Designer of the Year award. This partnership between Cheltenham Art Gallery & Museum and the Gloucestershire Guild of Craftsmen is an exciting new initiative. 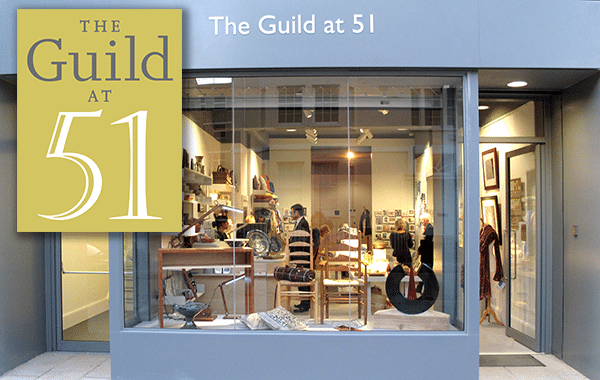 The Guild at 51 will help bring the museum collection to life by showing contemporary work in the same tradition, organising workshops and demonstrations, and above all forging a relationship between the maker and purchaser that can add another layer of significance to what are already well-designed and beautifully made pieces of craftwork. Writer, former curator at Cheltenham Art Gallery & Museum and Chair of the Gloucestershire Guild of Craftsmen. This entry was posted in categories; Cheltenham Art Gallery, Guild at 51.